Birdathon 2019 has launched click to find out more! Recently Tahoma Audubon and the entire environmental community lost an icon. Helen Engle was the founding ‘mother’ of Tahoma Audubon and worked tirelessly on protecting the natural resources of Pierce County and beyond. Enjoy the newest Towhee Newsletter! connects people to nature through education, recreation and conservation. Founded in 1969, Tahoma Audubon Society is a member-driven and volunteer-supported grassroots organization that is recognized as a conservation leader. Tahoma Audubon Society is the Pierce County Chapter of the National Audubon Society. 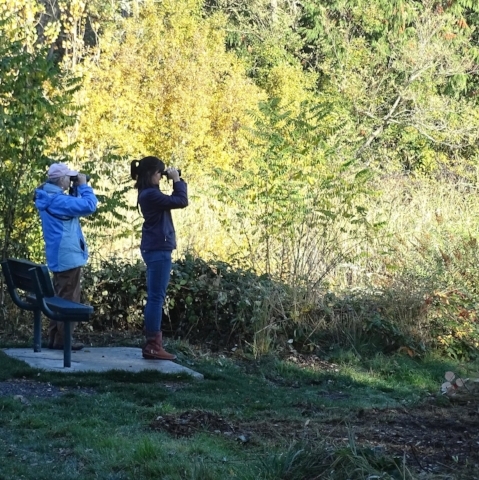 Tahoma Audubon's members, volunteers, and staff partner together to make a positive difference in the lives of people, birds, and wildlife in Pierce County, Washington, while protecting habitats for future generations. Join other people of color to look for some of the most amazing birds in your local neighborhoods! Join TAS in restoring wildlife habitat and protecting working farms, forests and open places. Support us! We rely on contributions to continue our work! Donate, volunteer, join!